This exciting itinerary starts and ends at Pisa airport, because that is where most of our international guests arrive. We’ll discuss with you the best times to arrive there. Pick-up at Pisa airport between 11:00 hrs and 13:00 hrs (1pm). Transport by mini-bus or car to the watermill. Light lunch in the watermill courtyard dining room. Afternoon: settling in; exploring the mill, the gardens and the river. Early evening: aperitivi on the vine verandah; brief welcome from The Watermill and Langues Services teams. Discussion of the week’s activities. 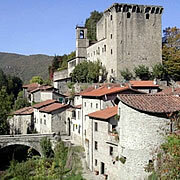 Transport by minibus to the nearby walled Medieval town of Fivizzano (about 5 minutes’ drive). 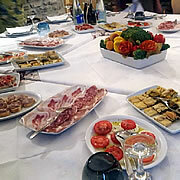 Dinner: an introduction to Tuscan cuisine at the Caffé Elvetico in the Piazza Medicea Fivizzano: locally made antipasti, including hams, salumi, crostini, bruschetta, caprese, torte locale varie; ‘patriotic pasta’ (three different pastas, with red (ragù), white (salsa di noci) and green (pesto) sauces, the colours of the Italian tricolore; local pecorino, fresco and semistagionato, served with insalata verde; locally made dolci. Local red wine and white wine; acqua minerale, coffee/teas. Continental breakfast at the mill (cereals, fruit juices, fresh bread/toast, brioche, jams, fruit, boiled eggs, coffee, tea). First language session/assessment (say 10:00 hrs to 12:30 hrs) by Langues Services, on the vine verandah, the studio (overlooking the gardens and the river) or the main salotto, as appropriate. Lunch in the watermill courtyard dining room: finocchio al forno (in a white wine, cream and cheese sauce); bresaola, with parmesan shavings, olive oil and rucola; panzanella (the watermill’s own recipe); hard-boiled eggs with mayonnaise and capperi; insalata verde (from the watermill garden in season) with borage or nasturtium flowers according to the season and a mustard vinaigrette dressing. Afternoon language session at the mill: (say 14:30 hrs to 17:00 hrs). Early evening: aperitivi on the vine verandah. Dinner at the mill: tris of fresh tomato purée with stracchino and ricotta cheeses, sformata di piselli (home-made compôte of peas, pickled zucchini stuffed with anchovies; arista di maiale (Tuscan-style roast pork) with seasonal vegetables; home-made chocolate mousse. Wines. Morning language session (say 10:00 hrs to 12:00 hrs) by Langues Service, on the vine verandah, the studio or the main salotto, as appropriate. Transport to Verrucola (around 12:15 hrs; about 10 minutes’ drive): impressive castle with village nestling around; walk around the village. Short talk on its history. Talk to passing inhabitants. Lunch at Il Castello restaurant at Verrucola (13:00): pasta pomodoro; Roman beef stew (stufatino alla romana); fresh fruit salad; wines; coffee/tea. Possible activity in the early afternoon: Walk across the valley, via ancient bridge, then through olive groves and vineyards to the church at the village of Pognana. Mid-afternoon (say 15:30 hrs): transport from Pognana to the watermill. Dinner at the mill: black rice and piquant carrot purée; crespolini (crêpes/omelettes with a vegetable filling), vegetables and potatoes; home-made apple crumble. Wines. After dinner: Coffee/tea and digestivi in the main salotto. Short morning language session (say 09:30 hrs to 11:00 hrs) by Langues Services, on the vine verandah, the studio or the main salotto, as appropriate. Transport to Fivizzano (around 11:15 hrs): market day: produce stalls etc. ; opportunity to explore city walls. Talk to stall-holders, café staff etc. Lunch in Fivizzano: Panino, home-made ice cream and coffee at the Gelateria Ricci in Fivizzano. Transport (say 14:00 hrs) to the watermill. 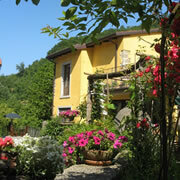 Afternoon language session (say 14:30 hrs to 18:00 hrs) Early evening: aperitivi on the vine verandah. Dinner at the mill: farfalle alla primavera (butterfly pasta with fresh vegetables); scaloppine Milanese di tacchino (turkey escalopes with seasonal vegetables), zucchini fritti, a speciality of our chef Mirella; home-made pannacotta. Wines. Early continental breakfast (say 0800 hrs) at the mill (cereals, fruit juices, fresh bread/toast, brioche, jams, fruit, boiled eggs, coffee, tea). 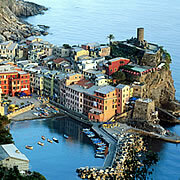 Morning and afternoon: sightseeing in the Cinque Terre or Lucca. Packed lunch provided by the watermill (or guests can buy their own lunch or a snack at location). Train back to Aulla (arrives circa 18:30). Dinner at the mill: tagliatelle ai funghi porcini (tagliatelle pasta with porcini mushrooms); salmone al forno (salmon fillets baked in the oven); salad in season, or other fresh vegetables; home-made tiramisù. Wines. Morning language session (say 09:30 hrs to 12:00 hrs) by Langues Services, on the vine verandah, the studio or the main salotto, as appropriate. Light lunch at the mill: Home-made goat-cheese-and-tomato torta with home-made coleslaw; fresh fruit. 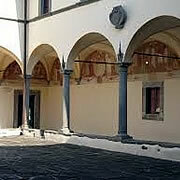 Afternoon: Transport to Pontremoli (around 40 minutes) for guided tour, including statue stele, by Farfalle in cammino OR Exploring the via Francigena with Faralle in cammino. Guided historical tours in Italian. Transport to watermill late afternoon. Dinner at the mill: Gorgonzola soufflés; Tuscan sausage with Tuscan lentils in a balsamic dressing, grilled aubergines, roast potatoes; Torta di cioccolato da Capri (chocolate cake made with crushed almonds instead of flour). Wines. Morning language session (say 09:30 hrs to 11:45 hrs) by Langues Services, on the vine verandah, the studio or the main salotto, as appropriate. 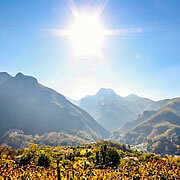 Explore village: ancient houses and church, spectacular mountain views, valleys, hill-top villages, olive groves, etc. Possible visit to local vineyard. Walk (circa 1000 metres) to Al Vecchio Tino restaurant for special gourmet lunch: risotto con pere e gorgonzola (pears and gorgonzola); sanmarino fish (char or ‘Brook Trout’) baked in chestnut leaves, seasonal vegetables; sorbetto con limone (lemon sorbet). Coffee, tea. Wine. Farwell language session (say 16:00 hrs to 18:00 hrs) by Langues Services, on the vine verandah, the studio or the main salotto, as appropriate. Early evening: prosecco on the vine verandah. Dinner at the mill: Insalata tepida di riso con pesto (warm pesto rice salad); involtini di pollo (rolled chicken breast with cheese, ham, herbs); pears braised in red wine, with cinnamon and vanilla. Wines. We can cater for vegetarians and others with dietary requirements (please tell us in advance). This is a draft itinerary. It can be altered to suit the group’s cultural requirements, to be discussed with each participant.